This is the FIRST Robotics Competition that has taken place at the North West High School in Jackson and local teams say they are happy to be a part of the program. 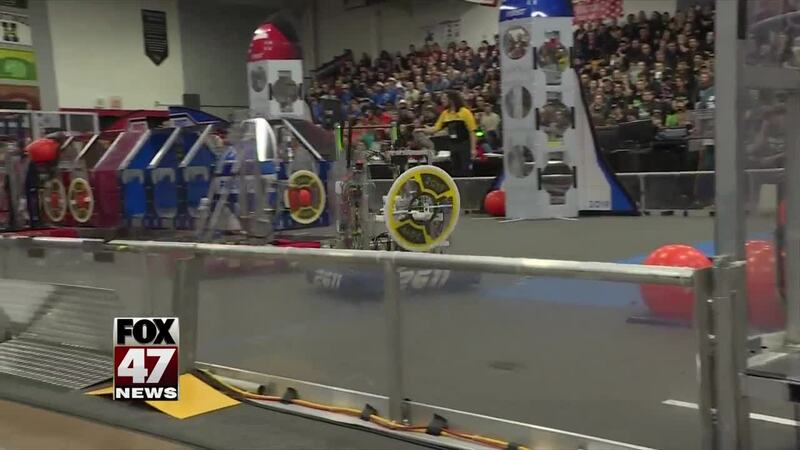 JACKSON, Mich. — This is the FIRST Robotics Competition that has taken place at the Northwest High School in Jackson and local teams say they are happy to be a part of the program. Olivia Macomber from Team 2611, Jackson Vectors says, "getting involved really helps makes you feel like you're part of something bigger because you are. You make a robot and getting to see it preform on the field, seeing it do well is just really inspiring." Even coaches and mentors are excited to help students learn more about the program and love being involved in watching the students grow. Tim Warneck, Coach of 7197, Mountie MegaBots and Event Coordinator said, "To see the kids go from barely being able to use a drill to becoming lead pit or (a) lead mechanic and actually working on the robots, you see the kids grow so much and the interactions are awesome for the mentors too. They get a chance to - it's kind of like a creative release for them to see kids grow in what they're doing." One student says that he gets so into the competition, he completely forgets about his surroundings. "It's nerve wracking at first, but once your driving you get really into the game, you completely forget about your surroundings." said Evan Hutchins from team 7197, Mountie MegaBots. 40 teams are competing to qualify for the state competition that takes place in Saginaw Valley in the beginning of April.